Everyone at school is playing the new computer game, Octopus Dare, but only Dinah is good enough to beat it. But she forgets who she is when she looks into the whirling eyes of the Octopus...What is happening, and how is the Demon Headmaster involved? 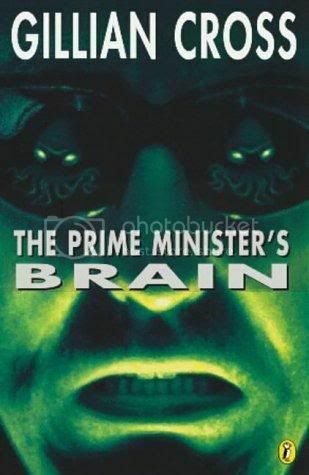 And what will he do if he really does get into the Prime Minister's Brain? The sequel to The Demon Headmaster! I enjoyed this one a great deal more than its predecessor. The characters end up splitting up at the beginning of the novel, and the chapters are set out nicely to alternate between their different narratives, which varies the plot slightly and gives us an all-seeing eye of sorts. Some of the language used is quite dated, and it reads sometimes as a jolly-oh Enid Blyton type of novel. This strangely contrasted with the futuristic, mechanical feel of the novel, and felt quite odd. The characters in the book do remind me a lot of the Famous Five, and to associate them with computers and the future is just completely bizarre. I didn't realise there were six books in this series! I have only ever read the first two. I doubt I'll track down the remaining four, however, as I'm not too sure it would be worth my while. I much preferred this novel to the last, but perhaps I am just remembering my feelings on first reading it. I remember absolutely loving it. I probably won't visit The Demon Headmaster and SPLAT again for a long while, though. This is the end of my nostalgic readings for now. I am now moving onto some very thick books and I am excited, but slightly nervous about the imminent book avalanche that will no doubt occur when I try to remove the next one from my shelves. 35 / 72 books. 49% done!